October 17, 2016 - How Much Will Hurricane Matthew Cost? Though stocks rose Friday after statements from Federal Reserve officials, the major indexes ended the week lower amid choppy trading. For the week, the S&P 500 lost 0.96%, the Dow fell 0.56%, the NASDAQ dropped 1.48%, and the MSCI EAFE declined 1.40%. Whenever disaster strikes, people often wonder: What's all this going to cost? Though the human toll of injury and death may be incalculable, experts have gotten pretty good at estimating the economic costs of lost production and physical damage due to major storms. 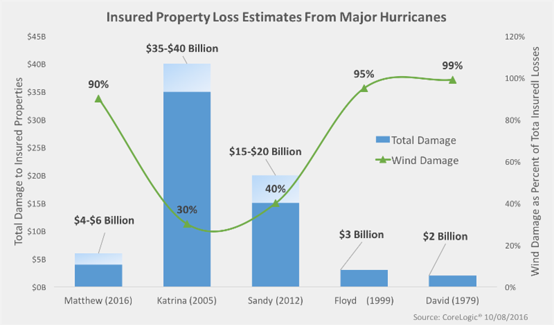 According to one economist, about two-thirds of the economic losses of a hurricane are related to property damage while one third come from economic losses. The insurance costs of property damage due to Matthew's wind and storm surge are currently estimated to be between $4 billion and $6 billion, though those figures may rise as claims start rolling in. The chart below shows storm damage estimates for four major hurricanes since 1979. We can see that Hurricane Sandy and Hurricane Katrina dwarf Matthew in terms of overall damage. However, Matthew is estimated to have a higher percentage of losses due to wind damage, which could have implications for insurance companies. 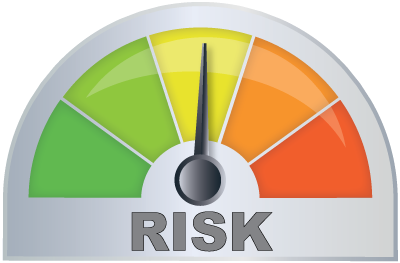 Damage from storm-caused wind and surge is generally covered under standard homeowner's and business policies, though they are often subject to high deductibles. One estimate of Matthew's overall cost, including evacuations, lost revenue, and other important factors, puts the total cost at over $10 billion. Though that figure is a drop in the bucket of the overall U.S. economy, the localized effect of closed businesses, damaged roads, and flooding in affected areas could be devastating. Flood damage is not usually covered, and many hurricane victims don't have specialized flood insurance. How much do disasters like Hurricane Matthew affect larger economic questions like Federal Reserve policy? We don't know how the Fed considers natural disasters, but it's likely that regional Feds like the Federal Reserve Bank of Atlanta include disaster-related figures in their reports. Recent comments by Fed officials have left us with a cloudy picture about future interest rates. While it's clear that many Fed officials believe economic conditions are strong enough to warrant a December rate hike, Fed Chair Janet Yellen isn't so certain. In a Friday speech, she gave us some insight into the Fed's reluctance to move on interest rates, saying that anomalies in economic trends leave her inclined to run a "high-pressure economy" to reverse more of the economic damage before it becomes permanent. September retail sales rise. Retail sales rebounded 0.6% last month, boosted by auto sales, which could be good news for the holiday shopping season. Business inventories increase in August. Stocks of goods rose, especially among U.S. retailers, suggesting businesses might be expecting healthy demand for goods this quarter. Consumer sentiment drops to one-year low. A measure of how optimistic Americans are about their financial prospects plummeted this month, suggesting Americans are concerned about the economy ahead of elections. Small business confidence falls in September. A measure of confidence among American small-business owners dipped last month as declines in job openings and inventory investment declined.